Like 2 billion other people in the world, I have a Facebook account. Unlike most of them, I very rarely use it. I do open the site once or twice a month, primarily to see new photos from friends and relatives, and to catch up on Bloom County (which includes the only civil discussion section on the internet). Other than that, nothing. I haven’t posted anything to my timeline in several years, rarely leave comments, and certainly never click on anything – lest Facebook track me around the web. 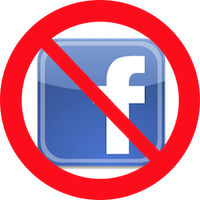 As to why, read the words of a writer for The Guardian who explains what caused her to stop using Facebook, and why she’s very cautious about starting again after four years. I didn’t make a conscious decision to leave Facebook. It was similar to when I stopped smoking: every other time I’d made a song and dance about quitting I had failed, but when one day I realised that it didn’t make me feel good it dawned on me that I wouldn’t be missing out. But it’s the messiness of my home feed that reminds me why I left in the first place. I am perplexed by some of what Facebook now thinks is a good idea: inserting into my news feed all the happy birthday messages people I know have left on other people’s walls (why? what?). Much on the news feed is a cacophony of dullness and makes for a messy interface. This I haven’t missed and is why I suspect my head has felt at least a little clearer these past four years. Just one less screaming technological wail of attention to deal with. I completely agree. The messiness of Facebook is just one factor that never made me feel good either. Whenever I do open my account, the page seems to be overun with advertising, mixed with that “cacophony of dullness” resulting from a random stream of mostly meaningless stories. The result is that “screaming technological wail of attention”. A phrase I’ll have to remember. Now, I’m not a technological hermit by any means. I spend a lot of time on Twitter, but I find that platform far easier to adapt to my needs, and much more useful. I regularly share my photographs on Flickr and elsewhere for anyone to view.1Although we’ll see if I stay depending on what Verizon decides to do with it following the purchase of Yahoo properties. And, of course, I’ve been ranting in this space for almost fourteen years, even if the potential audience is far below 2 billion people. Not that anything in this particular rant matters anyway. With or without me, Facebook will likely keep growing, both in users and the profit from selling them to advertisers. Little ol’ me isn’t going to slow them down. However, I’m picky. I want to have a little more control in my online life. And much less chaos. For our little group here in the overly-large school district, it’s been an unusually busy first month of the school year, due in large part to a flood of technology-related changes, some of which I’ve ranted about recently in this space. Â Of course, we’re only at the starting point when it comes to students bringing their own devices to school, using Google Apps, figuring out if and how tablets might work in the classroom, online textbooks, and there’s more to come. However, it’s also been been interesting, and somewhat amusing, to be in the middle of the planning for all these new pieces. Â We are fortunate in our system to have plenty of support (both people and infrastructure), but it’s very clear that there are many concerns and doubts about these changes we’re trying to make. While people offer a variety of reasons for their trepidation, I think almost all of it can be boiled down to one simple explanation: fear of losing control. Or at least concern over transferring some control to other people, especially the kids. Take, for example, the team that’s responsible for implementing our use of Google Apps for Education this year. Â Sitting in these meetings, it’s not hard to see that many in the group are somewhat uncertain about moving forward as they try to create a “standard support plan”, one that looks and acts the same as those from past experiences with the deployment of new software and services. Much of that uncertainty, especially among the IT folks (who are in the majority in this group), stems from our district’s do-it-ourselves mindset when it comes to technology services. Our IT department builds and hosts just about every internal web service, and, if that’s not possible, they want complete control over the products. Outsourcing is a dirty word around here and suggestions of using “open source” (or anything not blessed by Microsoft) is practically grounds for firing. However, when it comes to Google Apps, most of our “standard” processes don’t apply. Â Although our district logo appears on every page, that’s about all the customization. The software itself belongs to Google. They make changes when they feel like it, without bothering to ask permission of our IT department, and often without notice. Â Google controls 90% of this particular project. Since, as I said, we’re just beginning, it remains to be seen how these tools and the rest are going to play in the schools. How much control are principals willing to allow their teachers? And more importantly, can teachers share control and responsibility with their kids? I’m still confident about the possibilities, especially for the long run. It’s going to be fun watching this play out. In a recent article for the Guardian (mercifully one British newspaper not owned by Rupert Murdock), Dan Gilmore makes some interesting points about who controls the information you post using social networking tools like Twitter, Facebook, and the current buzz champ of the digerati, Google+. He says we need to consider not only what we get from these free services but also what we’re giving away in the bargain. Control, ownership and value are inextricably linked, but having one does not necessarily boost another. Exposure on a site you don’t control may be worth more to you than lack of attention on a site you do. And you may find the social and professional connections you make and enjoy on third-party sites so useful that they’re worth what you are giving up. But it’s worth weighing the tradeoffs. If you make G+ (or Facebook or Twitter or LinkedIn or Tumblr any other service that hosts your conversations and other “content”) your primary online presence, you are in effect giving away something enormously valuable. You are giving your contributions to the emergent global conversation to a company that values you largely as a contributor of data it can then turn into money. I’ve never been under the illusion that the content on this site has large amounts of value to anyone but me (certainly not in monetary terms), butÂ since I started doing this many years back, I’ve had the feeling that I would be better off in the long run if my primary online presence was on a site that I owned and was under my control (or as much ownership and control as the public web allows). It’s not that I fear what Google or Twitter or Tumblr might decide to do with what I post (Facebook can be a little creepy in their decisions around privacy but still not something to fear), I just like to make my own decisions about those little bits of information. On a related branch of this discussion, we also need to incorporate some of the ideas about which Gilmore is writing* into what we teach kids, and adults for that matter, about creating and maintaining their online image. Helping them avoid giving away control of their thoughts and ideas to someone else. *And no, I didn’t miss the irony related to Gilmore posting his ideas on the topic of control to the online edition of a newspaper, although I assumed he was paid for the work.